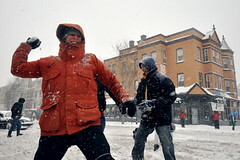 Amongst our Twitterati, folks are also calling for a second snowball fight at 14th and U Street, this time without the gun-toting off-duty detective (Stay home, Baylor!) as well as a fight on Logan Circle. Watch this space for additional snowball fights, and add others as you hear about them in the comments! What ended up happening to Baylor? Oh yea. The NAKID one is going to be awesome! Put them on the map! Don’t worry guys, the ellipse is park police property, MPD won’t be responding? Although, Secret Service is close by and might think those snow balls are a threat to the president so keep those snowballs on the southern end and away from the vista! Let’s do it, Arlingtonians!!!! You know you want to pelt each other with snowballs tomorrow!!! Post on your Facebook, e-mail all your friends and neighbors, spread the word all over town and let’s make this a resounding success and a good time for all! Please leave your guns at home.